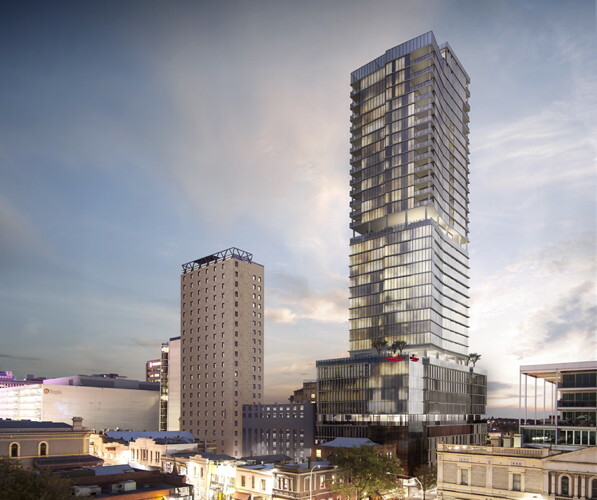 Crowne Plaza Adelaide will return in 2020, bringing the brand back to the city at its new address in Adelaide's tallest building, Frome Central Tower One. Martin Haese, Lord Mayor of Adelaide commented on the announcement: "I welcome the addition of the Crowne Plaza to the iconic Frome Central Development, in the heart of the City's dynamic East End precinct. With record numbers of interstate and international visitors, the City of Adelaide will benefit from more internationally-recognised hotel brands, like Crowne Plaza, to cater for increased demand." The mixed-use development will feature ground floor retail and the "Adelaidean" - 83 exclusive residential apartments – as well as the 326-room hotel, which will showcase the newest evolution of the brand. It will feature a unique check in experience on the 10th floor, infinity pool, bar, restaurant, gym and parking facilities, as well as approximately 600m2 of cutting edge meeting and conference space, reflecting one of Crowne Plaza's global hallmarks. Building work on Adelaide's tallest building has already commenced, making Crowne Plaza Adelaide the only pipeline hotel currently under construction in the Adelaide CBD. Abhijay Sandilya, Senior Director of Development, Australasia, at IHG said: "We are very excited to bring Crowne Plaza back to Adelaide, after a brief hiatus. As the city comes alive around us with the Fringe Festival, it demonstrates the need for a contemporary, upscale hotel that embraces both business and leisure travel, with a focus on events. We are confident that Crowne Plaza Adelaide will capitalise on strong corporate, conference and leisure demand." Theo Samaras, Managing Director of Kyren Group added: "Adelaide is a vibrant city and one of the more stable Australian hotel markets, with just over 4 million visitor hotel nights per year and growing. As we build this iconic development in the centre of Adelaide, we cannot think of a better partner than IHG, nor a more exciting brand than Crowne Plaza to welcome travellers to Adelaide 365 days per year.."
Once open Crowne Plaza Adelaide will complement IHG's existing properties, Holiday Inn Express Adelaide City Centre and InterContinental Adelaide, giving every traveller the right hotel for their stay. IHG currently operates 47 hotels in Australia, including: InterContinental, Crowne Plaza, Holiday Inn and Holiday Inn Express, Hotel Indigo with a further 17 in the development pipeline, including Hotel Indigo and EVEN Hotels.